Can an 18-year-old high school student do justice to one of the greatest roles in the English language? When that student is Grace Bolander, yes, indeed. Actors’ Theatre has pushed the envelope with its season-opening production of Hamlet, giving the title role to an actor who is not only a teenager but a female to boot. If you suspect the casting is simply an attention-getting gimmick, you obviously haven’t seen the show. Once you do, you’ll realize that Bolander was simply the best person for the part. Over the years, I’ve witnessed various takes on the Danish prince, all attempting to explain a puzzling man who seems eager to avenge his father’s murder, yet keeps finding excuses to delay action. Bolander quickly puts her own stamp on the character, portraying him as tearfully emotional one moment and wickedly humorous the next. She also ups the tempo at key moments, allowing the familiar words to tumble out in a dazzling torrent. Once or twice, the words come a little too fast, rushing the dialogue, but overall her performance is remarkable. Despite Bolander’s star-making turn, the best thing about Actors’ Theatre’s production is that every performance is remarkable. Co-directed by Nick Baldasare and John S. Kuhn and set in the late Victorian era, this Hamlet interprets each character with clarity and conviction. John Heisel is a combination of dull-witted malice and honest remorse as King Claudius, the uncle who allegedly stole his throne by murdering Hamlet’s father. As Gertrude, Hamlet’s mother and Claudius’s new bride, Janetta Davis exhibits both wifely support and—after her distraught son shows signs of mental instability—maternal concern. Josh Katawick is a rock as Horatio, the one friend Hamlet trusts. John Quickley and Sarah Gehring portray Rosencrantz and Guildenstern as such superficial simps that it’s clear why they’re the friends Hamlet doesn’t trust. As the aged Polonius, John Feather is humorously doddering and sanctimonious. As Ophelia, his daughter and the object of Hamlet’s affection, Rachel Gaunce projects sweetness and innocent virtue. More solid work is turned in by John Connor as Laertes, Greg Hoffman as the ghost of Hamlet’s father, Jordan Estose as Osric/Messenger, John Beeler as Marcellus/Lucianus, Andy Falter as the Leading Player and Christina Yoho as the acrobatic Player Queen. Providing able technical support are designers Trent Bean (set), Emily Jeu (costumes), Jarod Wilson (lighting) and William Bragg (sound). Jason Speicher choreographed the climactic fight scene. In recent years, Actors’ Theatre has branched out from its traditional focus on Shakespeare in an attempt to broaden its audience. And when it did take on the Bard, it sometimes did so in a way that was designed to amuse non-Shakespeare fans: for example, by mixing puppets with live actors (good idea) or by adding jokey pop-culture references and slapstick (bad idea). Despite its unconventional casting, the current production provides welcome evidence that Actors’ remains capable of doing Shakespeare straight and putting on a great show in the process. 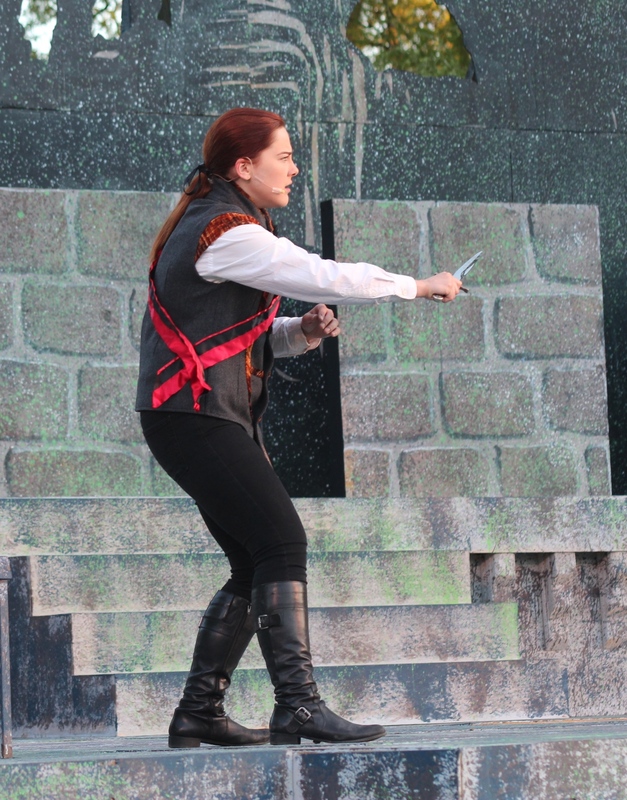 Actors’ Theatre will present Hamlet through June 22 at the Schiller Park amphitheater, 1069 Jaeger St. Show times are 8 p.m. Thursday-Sunday. Running time: 2 hours, 15 minutes (including intermission). Admission: Pay what you will. Bring a blanket or lawn chair. 614-444-6888 or theactorstheatre.org. Special event: A memorial for Columbus actor Carl Novak, who died unexpectedly last month, will be held at 2 p.m. Friday (May 30) at the Schiller Park amphitheater.